This hard drive enclosure fits most 7mm/9.5mm 2.5 inch SATA I/II/III HDD SSD and supports max 2T. With a maximum data transfer rate of 5Gbps, 20% faster than traditional USB 3.0. With a maximum data transfer rate of 5Gbps, 20% faster than traditional USB 3.0. Tool-free installation, easy to operate and use, plug and play. 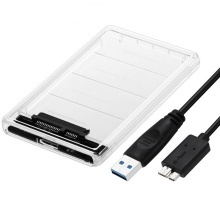 Transparent shell design help you to distinguish which hard drive is inside. Made of fireproof, shockproof ABS material, solid with high durability. Lightweight and compact, convenient to carry and store. 1. Hard disk drive is not included in this product. 2. Format the partition when the new hard disk drive is used.